Sara Juarez, 36, prepares dinner for her family. She lives in a slum named Nueva Esperanza (New Hope). Sara makes batteries at the Sanyo Electric Co. maquiladora (maquiladoras are what the factories are called), one of Tijuana's largest factories. Please read below for her story. When it was being signed into law NAFTA’s supporters claimed that it would make people's lives better, that it would help alleviate social injustices caused by economic disparity. Because Mexico was the poorest of the countries that signed the pact much was said about how NAFTA would improve Mexicans' lives. NAFTA did create jobs in Mexico, however whether it could be called an improvement is debatable. Wages in the factories remain low and the cost of living keeps rising. So while people have more money in hand they’re also paying more to live. 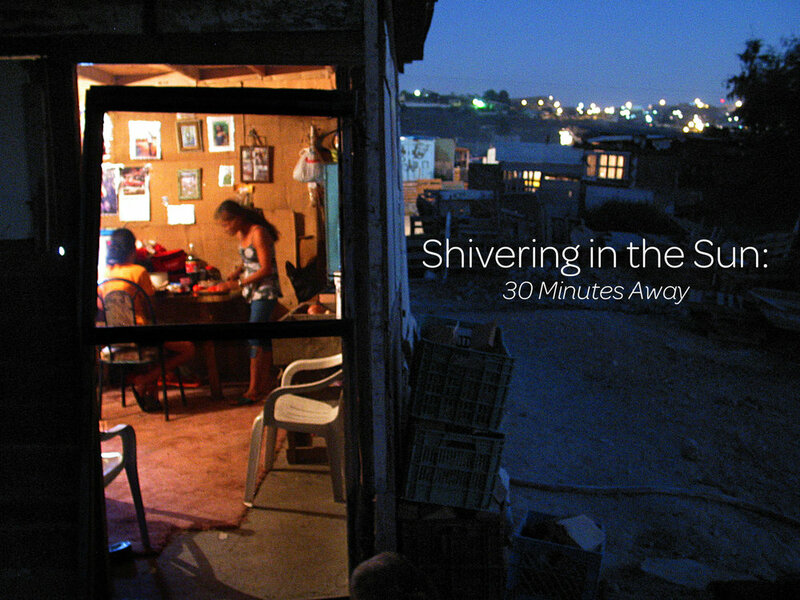 30 minutes away from the manicured lawns and neatly paved streets of San Diego Mexicans live in extreme squalor while producing products that the rest of the world consumes. These slums starkly illustrate the cost of what happens when there are not regulations, or they’re not followed, precisely what the Koch Brothers and the Republican government of the United States wants to bring back to this nation claiming that it will “Make America Great Again.” As the 45th president and his Republican Party negotiate downward the following is what American’s can expect if we adopt the unregulated standards that result in the poverty that so much of the world suffers through. A young boy holds onto an alive electrical wire while he helps his father rig power for their house in Nueva Esperanza. Many of the people who came to Mexico’s northern border came from small towns such as El Gusano featured in the last post. While they did not earn much money in their small villages back home, in many ways life was better: the environment was cleaner, the labor they performed was for their direct profit, they could stay with their families and shape their land as their families had done for generations. Working in the maquiladoras in the north meant that they lived in shantytowns either renting squalid cinderblock dwellings or wooden shacks producing products that they themselves would never be able to afford. It's understandable that so many in the maquiladora slums would rather live across the border in the places where the products they manufacture ultimately end up. A young man returns to his home after school in Nueva Esperanza. An abandoned battery recycling plant where toxic barrels rot. 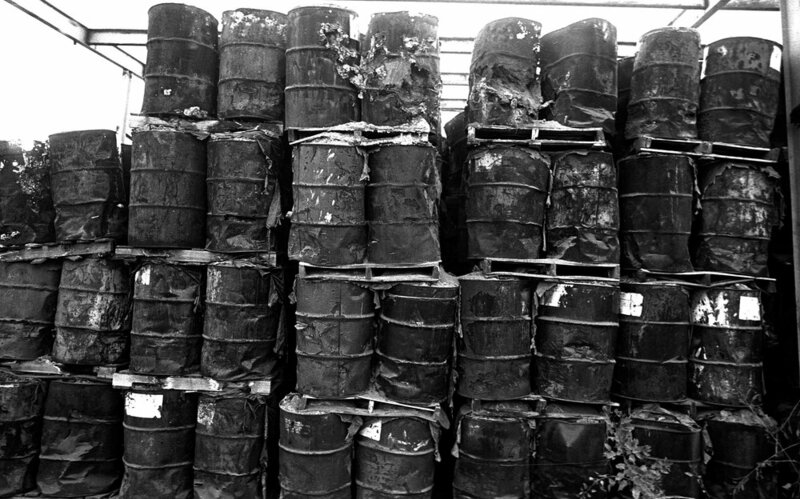 The 8,500-ton of barrels burst with toxins. Wind carries the waste over the houses below, while rain washes it into a school playground. A little girl plays in front of her house in the Colonia Robledo, a poor neighborhood in Mexicali that sits next to several industrial parks. Discarded batteries near an abandoned battery recycling plant. Nueva Esperanza. This spot used to be a popular leisure spot where people would come on Sundays before the factories moved in. Because of dumping the river is polluted and smells of toxins. 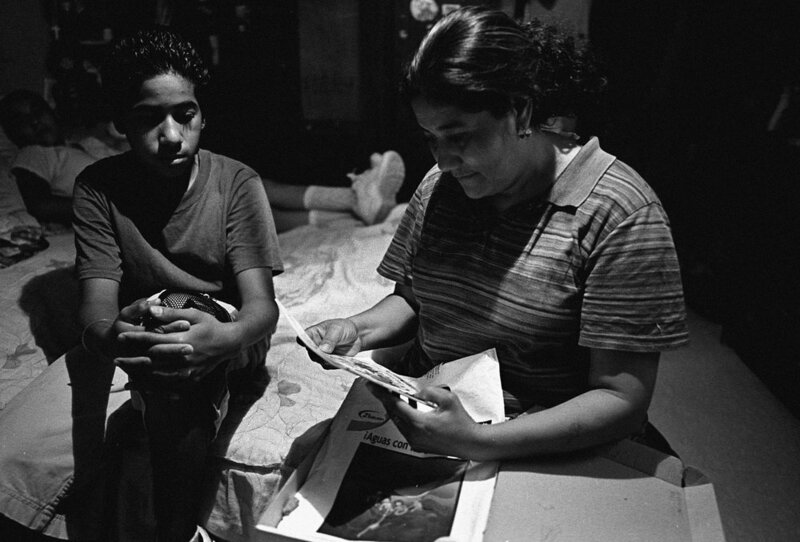 Teresa Gómez, who started working in a Tijuana maquiladora at age 15 (she is now 16) sitting. She lives in Nueva Esperanza with her mother Sara, not pictured. Sara makes batteries at the Sanyo Electric Co. maquiladora, one of Tijuana's largest: "My shift is from 7-5; then come other workers for the night shift from 5-1:45. I'm from Veracruz. There was no work there and no schools for my kids. I've been here [Nueva Esperanza] for about five years. We built this house ourselves. We're on this little slope because when it rains the water comes through the village. It's an awful river full of plastic and trash. This place can get dirty. Trucks come, I'm not sure from where, and dump their trash in the river. We try to organize clean-ups. My daughter Teresa started at the maquilas at 15. We asked the company if she could start early. I signed a form to allow that." Teresa: "I work for Marcos Calidad. They manufacture wooden frames and mirrors. I mostly cut glass. I've been there a year and make Ps750 a week ($75). No raise yet. Most of my friends work at the factories here. It's okay. I'm don't plan to leave." Lidia Orozco, 35, mother of 2 in the Colonia Robledo, in Mexicali that sits next to several industrial parks. She is looking over learning materials for a class she plans to take at a nearby college. “This place is a mess, a dump. The streets are unpaved and the dust is filled with chemicals. We may be poor, but we don’t want this factory trash here. It affects me. I cough and have asthma. I think that the municipal government is responsible for looking after what the factories throw out in the air. I’m not sure. I’d like to see a vocational school open up here instead of a factory. There’s nothing like that here. Before NAFTA there were fewer cars. You could count them pass by on the street. Now there are so many. Sometimes we just laugh at how much it’s changed. I don’t understand NAFTA very well." Guadalupe Arredondo—see below for her story. Jorge Arredondo, 31, hammers a sign to advertise his juice business; next to him is his daughter Guadalupe, 4. Jorge worked in a factory in Tijuana before the factory closed. He now sells juice street side in an industrial park. Ana Cecilia Castillo, a doctor both at a clinic in El Robledo and at a nearby maquiladora run by Thomson, a U.S. maker of widescreen televisions. Armirda Ortiz, longtime resident of El Robledo, a poor neighborhood next to factories. "I've had these (rash on her arms and neck) for a few years now. So does my husband. They get worse when the dust kicks up. I'm not sure what it is. I've never had allergies before. I put calamine lotion on the rashes to stop the itching, but it doesn't take them away. I need to use an umbrella when I'm on the street to shield my skin. The sun makes it worse. I haven't been to a doctor, we don't have health insurance, but my husband is working on that." Jesus Ruiz pictured on his porch in the Nueva Esperanza slum. He and his family, migrated from Mexcaltitan, a tiny island off Mexico's Pacific coast. At 16, Ruiz settled with his family at the edge of the low-income community of Colonia Chilpancingo in Tijuana, about a mile from the border. After assembling a home from wood and cardboard scraps, the Ruiz family found work at the factories. Soon the area was solid with shacks as Mexico's poor and jobless arrived seeking work. He has managed steady factory work and says that his current job, making bandages and IV bags at the US-owned Tyco International plant for $70 a week, is a good one. "At least it's clean. I made auto parts before and my hair and face were caked with dirt." For print sale offerings and project updates please join the mailinglist!